The Air Force One Print is a finely produced lithograph of the most famous aircraft in aviation history, flying more air miles with more presidents then any Air Force One, ever. This beautiful exclusive image shows Air Force One 27000 from a front ¾ view and from slightly above its nose. Extending out past the floor of its unique pavilion at the Reagan Library in California, 27000 seems to be moving, flying. She reaches proudly forward and displays, as she did on every mission, the symbol of power and freedom of the USA. 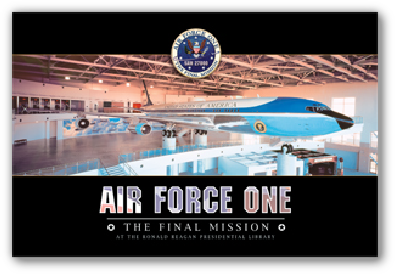 This Air Force One poster - lithograph is emblazoned with the official emblem of Air Force One: The Final Mission. With its large size and high gloss UV coated finish, this high quality lithograph is clearly suitable for framing. Measuring 24” X 36”, the Air Force One print will fit in a standard size frame.